Mr. Chancellor, Dr. Arthur McDonald has been acknowledged as one of this country’s most accomplished scientists, and one of the world’s leading theoretical physicists. After receiving his Master’s degree at Dalhousie and Doctoral degree at the California Institute of Technology, Dr. McDonald embarked on his long and distinguished career at the Chalk River Nuclear Laboratory in 1970, and was subsequently appointed Professor of Physics at Princeton University. He returned to Canada in 1989 as University Research Chair at Queen’s University and as director of what became one of the most productive research collaborations in Canadian history. More than 25 years later, he remains the Director of the Sudbury Neutrino Observatory Collaboration, where his team famously conducted ground-breaking research that led to the 2001 discovery of neutrino oscillations. I hasten to add – and with considerable pride Mr. Chancellor – that Dr. McDonald’s team included members of UBC’s Department of Physics and Astronomy. Fourteen years later, that discovery made him a co-recipient of the 2015 Nobel Prize in Physics, the most recent in a long list of honours bestowed upon him over the course of his remarkable career. In 2006, he was named an Officer of the Order of Canada; in 2007, he was the co-recipient of the Benjamin Franklin Medal in Physics, and in 2009 he was elected a Fellow of the Royal Society of London. In 2011 he was awarded the Royal Society of Canada’s Henry Marshall Tory Medal, and just last year he was promoted to Companion of the Order of Canada. Not surprisingly, his contributions have also been recognized by honorary degrees from seven Canadian and American institutions, and we take great pride in similarly recognizing him here today. 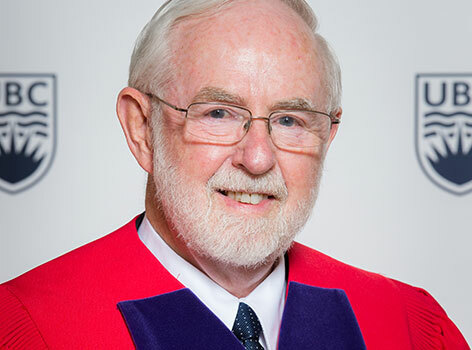 Mr. Chancellor, in recognition of his profound contributions to Theoretical Physics and to the scientific community of Canada, I ask you to confer the degree Doctor of Science, honoris causa, upon Arthur B. McDonald.